This is a folded book - no pages were cut or glued, so the book is actually still readable (if one desires to unfold the pages!) and not destroyed. * * * * * The photo shows the design you will receive, but not the actual book. I usually have an assortment of colors available (covers are typically red, blue, green, or brown) so if you have a color you'd prefer, please let me know. * * * * * Almost all of the books I use are older (pre-70s), so there may be a small amount of wear and tear, often at the corners of the book, or perhaps a slight yellow tint to the pages. If you'd prefer a new book, please contact me and we can create a custom order for you. Most of the books measure about 6" x 8" while closed, while on display,it measures about 7-8" wide when opened up gently for display. (There is some flexibility with the book, so that it might sit comfortably with different widths while opened.) The pattern featured here is the word "Love" with a heart in place of the "v"- an inspiring reminder, as well as a beautiful piece of art that is pleasing to look at and a great conversation starter! The book is shipped wrapped lightly with tissue, and will "relax" a little after unwrapping and leaving to sit out upright on display. 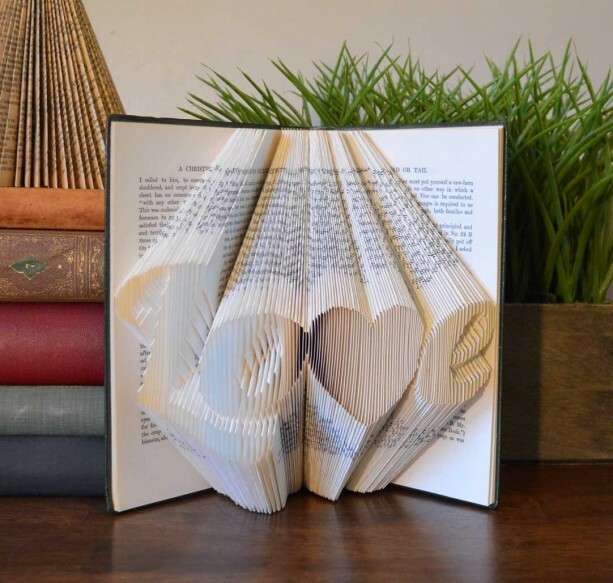 * * * * * * * * * * * * * * * * * * * * * * * * * * * * * * * * * * * * * * * * * * * * * * * * * * All of my folded books are from original designs - I do not use other templates or patterns, I create my own. * * * * * * * * * * * * * * * * * * * * * * * * * * * * * * * * * * * * * * * * * * * * * * * * * * Custom orders are available, please let me know if you have any questions!